Candy canes are the snack of the season, along with anything peppermint, to be sure. However, many traditional holiday treats combine chocolate with some sort of nut. In Walt Disney World, I can think of no better place to combine a few well-placed nuts with some rich chocolate than Karamell-Küche, found in the Germany pavilion of World Showcase. The Caramel Cluster Milk Chocolate Pecan is a simple construction, but it is in that simplicity that you can find a world of delicious flavors. 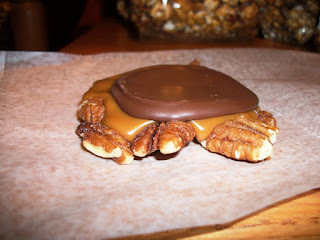 This snack starts with a base of salted pecans, which is topped with a glob of caramel and a dollop of milk chocolate. There is a sweet and salty element at play between the pecans and the caramel and chocolate, but the real story here is the layers of texture. The pecans aren’t crunchy, the tender and almost chewy. The caramel is as smooth as silk, and as sticky as any caramel you could find anywhere. The milk chocolate is also smooth, but with a richness that you can feel throughout your entire mouth. Remove any of these three elements and you’d have a good snack, but the Caramel Cluster Milk Chocolate Pecan is a great snack! Whether you are looking for a quick pick me up as you make your way around World Showcase, or perhaps your trying to come up with that perfect treat to sneak into a loved one’s stocking, I cannot think of a better bite than the Caramel Cluster Milk Chocolate Pecan. The name may be more than a mouthful, but it is a delicious mouthful!